Expect nothing less than expert house clearance services from Mr Van-ish. We also offer efficient garden clearance at a very competitive price. We know a thing or two about moving house or office. Our experience, combined with complete customer satisfaction, is sure to give you confidence. As an established removal company, you can depend on us for convenient house, garden, and garage clearance for complete peace of mind. Based in Lincoln, Lincolnshire, we are dedicated to helping you to live in a clean and tidy space as it helps to increase positivity and happiness. As part of our friendly, efficient service that is available 7 days a week at a competitive price, our team also offer a handy delivery service. Contact our removal company in Lincoln, Lincolnshire, for handy home and garage clearance services. At Mr Van-ish, we provide a comprehensive van service that we are more than happy to adapt to match your needs. Backed by many years of experience, our team also work before and after our standard hours to ensure that you receive a flexible service that is quick and helpful. Please feel free to get in touch to discuss your individual requirements, commercial or domestic. As a small, independent business, your 100% satisfaction is vital. Promising an excellent work ethic as part of our professional service, we are focused on making your experience the best it can be. 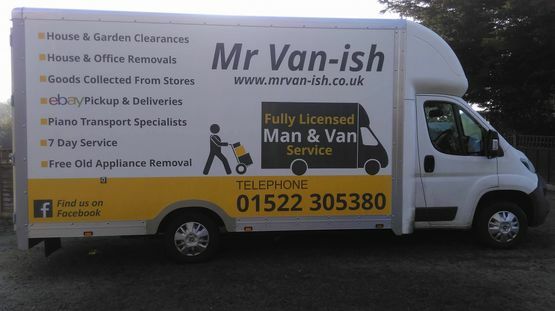 Look to Mr Van-ish today when you need house, garden, or garage clearance as well as deliveries of any kind and small removals. Whether you picked up a real bargain on eBay™ or are donating your old dining room table to your daughter for her first flat, we are ready to assist you. We are happy to pick up and deliver single items for you, however we do not remove food waste.